Have Fun Planning Your Wedding Table Displays! Your wedding table settings can be as unique as you are with just a little careful thought and creativity. Don't be afraid to experiment and try something that you've never seen at a wedding before, those kind of personal touches make your special day even more memorable to your family and friends. Mix ready made decorations like candle lanterns and ornaments with your own DIY creations, use photographs of you as a couple and feature them among the other decorations. Try and think of what items would be particularly suited to you and your partner given your lifestyle or pursuits and most of all have fun with it! Add a wow factor! 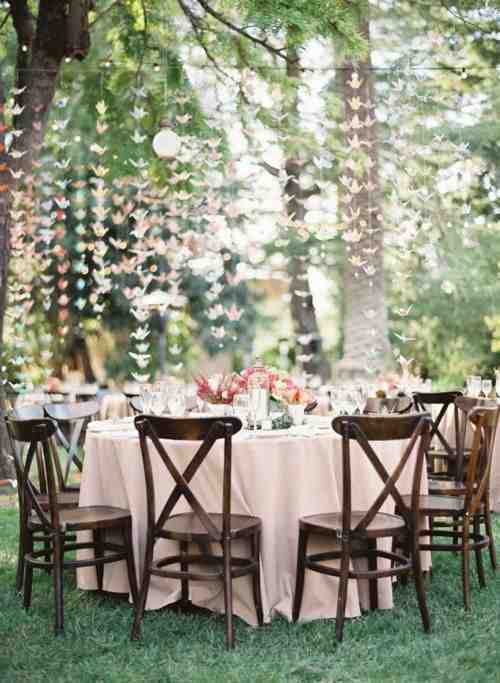 Hang flowers, ornaments or paper decorations at different heights over your table setting to create a unique feature. If you are using flowers to create an intricate feature then you would be better off using silk or handmade flowers so you don't have to worry about them wilting and so that you can arrange them well in advance. Think outside the box when choosing your table numbering system! You could use pretty picture frames to display the numbers, or hand write them directly onto a balloon attached to the table with some ribbon, some people even use wine bottles at the table to bear the number on the label. The more unusual the better! Personalise little treats and wedding favours at the table by choosing a plain paper box and handwriting the names onto them. Displaying flowers at the table can look really sweet if you take some smaller flowers or even flower buds and use tiny vases or containers dotted around the table rather than all the flowers being in the centre. 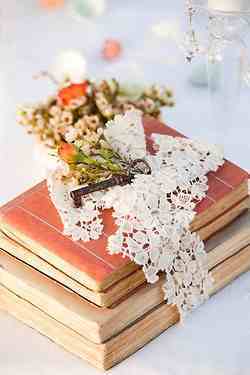 You can transform even the most mundane object into something fabulous for you centerpiece! Collect bottles and jars of all shapes and sizes and paint them up in cool metallic tones, filling them with flowers and other greenery. Bird cages as centrepieces are all the rage at the moment, use them to display flowers, decorations or even chocolates and desert! Using textiles like silk ribbon and lace along with the other decorations at the table can really enhance the look and give it such a romantic feel. A nice idea is to take single flowers without stems to create an interesting table display, you could even lay out the table numbers using the flower heads, or float them along with a candle in pretty glass bowls of water. See our Wedding Venue Décor and Ideas Board on pinterest http://pinterest.com/strawbridge54/wedding-venue-d%C3%A9cor-and-ideas/ for these and more inspirational images.